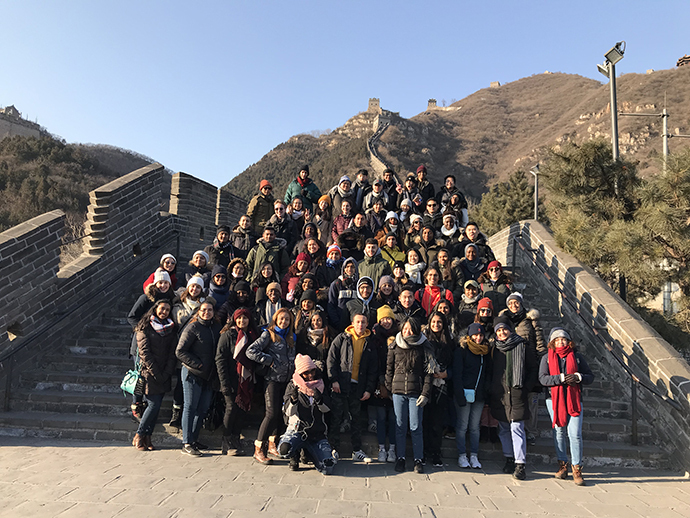 Sixty-eight students from Brooklyn College, other CUNY campuses, and beyond visit The Great Wall of China during their winter intersession trip. The Brooklyn College Study Abroad in China Program is celebrating 16 years of bridging American and Chinese cultures through its immersive academic coursework, which includes the arts, business, cultures, history, and languages of China. Over three weeks this intersession, 68 students from different CUNY campuses and beyond are exploring five Chinese cities: Beijing, Nanjing, Shanghai, Shenzhou, and Xi'an, as well as side trips to Guilin, Hong Kong, Sanya, Tibet, Yangzhou, and Yellow Mountain. Students can take three to seven credits of courses ranging from Asian Business to the Development of Silk Road to Intensive Elementary Chinese and Revolutionary China. China’s re-emergence as a global economic power and a bigger player on the international political stage makes it an invaluable trip for students. "China is one of the oldest civilizations on the planet and one of the fastest growing economies in the world," said Shuming Lu, a professor of communication arts, sciences, and disorders who leads the study abroad program. "The program not only provides an opportunity for our students to travel, broaden their cultural perspectives, experience personal growth, make new friends, and develop valuable career skills, but it also gives them an advantage in diplomacy. An academic understanding of China is now an employable skill in the global job market." For Anastasios Filippou, a sociology major, the trip was life changing. "We have had the most enlightening cultural experiences living and traveling in the East just like the locals would,” he says. “There were multiple times in this trip that my body and mind felt completely out of place. As a sociology major and marketing minor, I have observed multiple differences and similarities regarding the west and the east that will definitely define me as a person and as a professional." Natalie Lisiewicz is a senior double majoring in communication arts, sciences, and disorders and linguistics. She says she decided to study abroad in China because she wanted to go to a country that she might not otherwise visit. "The Chinese culture is so different from my own Polish-American culture," she says. "I have tried many different foods and interacted with so many wonderful people, despite a difficult language barrier. Visiting China taught me how to be more open to trying new things and how to be comfortable with being uncomfortable." 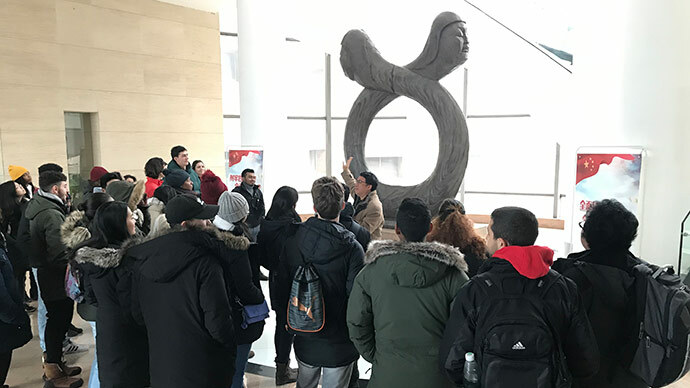 Students visiting southwest China’s Yangzhou museum with a tour guide, who is talking about two figures: Fu Yi and Nu Wa in Chinese mythology who were said to have created the earliest Chinese people. Omar Yakoup, a sophomore majoring in business administration says he initially went to take an Asian business course but will leave with a trove of other experiences that have influenced him all the same. "Moments such as climbing The Great Wall of China, taking a high speed train, visiting Xi' An University and Nanjing University of the arts, and climbing the Dr. Sun Yat-sen Mausoleum will never be forgotten and have been pivotal in helping me grow as an individual and intellectually," he says. Prajwal Prabhu, a senior majoring in finance and business administration, agrees that the trip has been transformative. "I am growing as a person and am expanding both myself and the network of my peers," he says. "The Chinese call this Guan Xi, the development of relationships with other individuals. The sense of community and friendship within this study abroad group has been unparalleled and future groups should look forward to learning a lot from it." Lu has been taking students on the trip every summer and winter since 2003. Each trip consists of anywhere from 50 to 75 students, both graduate and undergraduate. All of the courses are taught by Brooklyn College faculty and students have used funds from sources like the Chancellor’s Global Scholarship for Study Abroad and the Study Abroad Scholarship Association to finance their trips. For more information, students can contact the Office of International Education and Global Engagement. Check out the Brooklyn College Study Abroad in China Program from a 2014 trip.